Alan Pardew will soon be celebrating four years as Newcastle manager, and he is currently the second longest serving manager in the Premier League behind only Arsene Wenger, who has been at the helm at Arsenal since 1997, and has never failed to have Arsenal in the top four in all those many seasons. At the moment Newcastle are in 5th place this season with 19 points from our 13 league games. However, Newcastle made a very poor start to the season and we had no wins in our first seven league games, with four draws and four points. Alan Pardew has talked about this poor start – but things have really been turned around in dramatic style by the manager and the players and we have won out last six games in all competitions. One of the reasons Newcastle fans are hoping this good form and results is not just a flash in the pan, is that some of our younger players have come through and are playing very well. They include Paul Dummett, Rolando Aarons, Sammy Ameobi, Mehdi Abeid, Massadio Haidara, Adam Armstrong and new signing Ayoze Perez, and we have also had some injuries in that run of six wins in a row, which is one reason the youngsters have been given their chance. Next up is what will be a tough game at Upton Park on Saturday, and in the time we have been back in the Premier League since 2010, we have won there twice in the league, including a 3-1 win last season. We’d love to be able to get a win again on Saturday, as Alan Pardew approaches four years in charge of Newcastle on December 9th. Wonder if we can keep our win streak going until then? That’s quite a frightening statistic. Not because it relates to us and AP, more a reflection of the state of the modern game. I have called for a managers head (AP’s particularly on more than one occasion) as much as the next fan has. It’s quite horrifying how we demand instant success these days, but it’s also part of the norm of the modern football fan. Get this keeper, Sterling, signed up, smartish! FromWikipedia––– –––United’s league form quickly turned sour. In September, United suffered a humiliating 5–1 away defeat against fierce rivals Manchester City. Following this and an early season run of six defeats and two draws in eight games, a banner declaring “Three years of excuses and it’s still crap … ta-ra Fergie.” was displayed at Old Trafford, and many journalists and supporters called for Ferguson to be sacked. Ferguson later described December 1989 as “the darkest period [he had] ever suffered in the game”, as United ended the decade just outside the relegation zone ––– Ring any bells? Glad somebody’s out their pit. Lazy gits, the lot of ’em! I wouldn’t say we as nufc fans expect instant success really. 7 years of under investment with 4 of those being under a manager who got sacked from his league one job says to me we’ve been fairly patient especially where the kings concerned. In the past we did. Obviously some were not happy and bewildered by his appointment at the time including me, extremely underwhelming to say the least but again like many others we gave him a chance. The goodwill of fans can only last so long though can it not? In his time here he has repeatedly lied to the fan’s and been arrogant about it with that smug grin, backed his boss to the hilt by unnecessary arse licking. Obviously he’s not going to slag him off in public but he goes way too far. He’s even blamed the fan’s for losses, blamed the press, blamed the younger players, science, grass and loads of others that I can’t be arsed listing but not once has he turned around and blamed himself or fatty. Snivelling arse licking cretin. Still, if he brings consistancy to our results which so far he hasn’t over the course of his appointment and stops the horrid run of defeats to the mackems then maybe people would be inclined to respect him more. What I mean by this is we lurch from one disastrous run to another with a spell of good results inbetween. It’s not good enough for us as fans, as a club or our health. The fissures run deep but can, I think be repaired. Too much coffee when I get in I think. Alright lesh, AC, I directed the comments at football fans in general, although closer to home, I am very inclined to agree with you. Whilst I am off AP’s back for now, I still don’t see him as a manager who can take us forward to the next level, assuming the powers that be are looking to build. 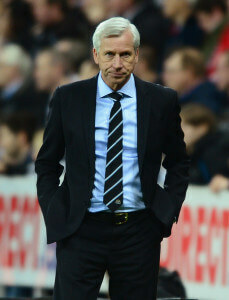 G, AC, at least your comments are fair and not the product of an obsession with Pardew! Are you suggesting that patience with Pardew’ll be rewarded with Prem and Euro dominance in future? Based on http://www.transferleague.co.uk/premiership-transfers/newcastle-united-transfers.html , Pardew’s net spend is almost zero over four years. Fifth spot with 12 players out injured. I doubt even Mourinho or Guardiola could have managed this. Now we can see why Ashley’s stuck with Pardew. Quite remarkable. I called for pardews head and feel a little silly now. If we had of been a bit luckier in the games at Palace, Hull and Swansea then we could have been 3rd, throw into that the bore draw against villa, and we could have been above Southampton and 2nd in the league only runaway leaders chelsea above us.